Only 30 per cent of children walk or bike to school each day, according to a new study, which is why many of them don't meet the recommended 60 minutes of physical activity per day. The research, conducted by a team from the Université de Montréal, also found that 80% of the children who walk or bike to school travel less than 600 metres. The study, which surveyed parents of nearly 1,500 kids who attend school in Montreal and Trois-Rivières, Que., sought to identify why children are not walking or biking to school and why rates of physical activity are in decline. American research has found that most nine-year-olds meet recommended daily exercise levels, but only 30 per cent of teens do on weekdays and only 17 per cent meet the standard on weekends. Data from Statistics Canada shows that only half of Canadians over the age of 12 are physically active during their leisure time and less than half spend one hour per week walking to work or school or completing errands on foot. "The decrease in walking and bicycling in Western societies is the consequence of a general trend towards sedentary lifestyles," said Dr. Paul Lewis, lead researcher and professor of urban planning. "This decline is explained by urban sprawl, greater distance to travel to more activities and modern schedules featuring tighter time-management." The 2008 data contrasts sharply with 1971 numbers, which show that 80 per cent of Canadian children aged seven and eight walked to school. The current data reflects changing trends in education, the researchers say. The rising numbers of special-purpose schools, such as those with a strong arts focus, as well as private schools means that it is no longer the norm for children to attend neighbourhood schools. As well, the researchers found that even if a school is as little as 300 metres away, some parents will drive their children to school because it's on their way. Furthermore, "parents fear for their children's safety in high urbanized environments," Lewis said. "Safety takes precedence over health." Local boards of education should promote physical activity programs and support schools that are located in high-population areas. Urban neighbourhoods should be made safer for pedestrians and cyclists. 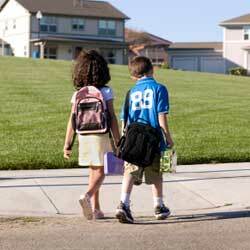 Parents should set a stronger example for children by walking or using public transit more often.